Donald Trump ran a presidential campaign focused on rule of law and national border security, and newly uncovered documents signal he is looking to fulfill that pledge as president. According to internal Department of Homeland Security documents obtained by the Washington Post, the federal agency has opened talks with local police forces on the enforcement of national immigration law, identified strategic areas where construction can begin on Trump's proposed border wall and identified some 33,000 more detention beds in which to house undocumented immigrants. The report, which has a publish date of April 25, 2017, also outlines ways in which the agency can speed up the hiring of hundreds more Customs and Border Patrol officers, signaling the administration's desire for a more robust Immigration and Customs Enforcement unit. Options for speeding up such hiring processes outlined in the document include putting an end to physical fitness and polygraph tests. 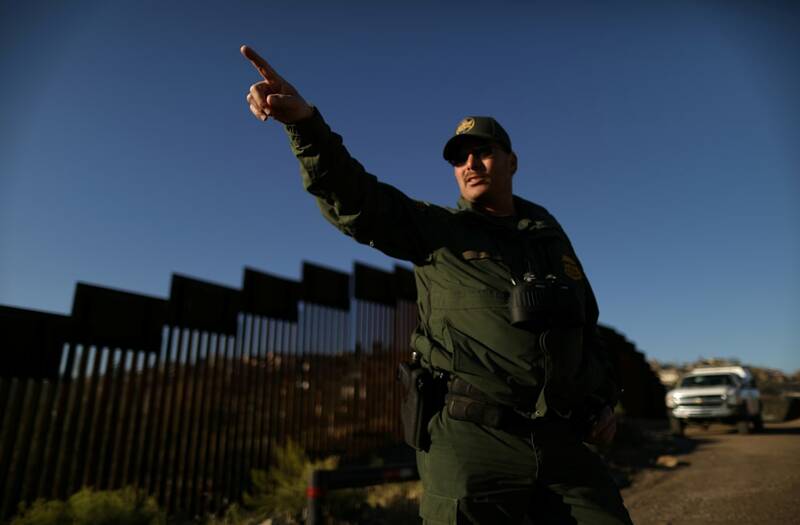 A U.S. Border Patrol agent stands for a photograph while keeping watch along the U.S. and Mexico border in Santa Teresa, New Mexico, U.S., on Friday, Feb. 17, 2017. The Trump administration outlined a sweeping crackdown on undocumented immigrants Tuesday, pledging to hire 15,000 more border patrol and immigration agents and to begin building a wall on the Mexican border to enact executive orders signed by the president on Jan. 25. US Border Patrol agents speak with a woman on the US/Mexico border in El Paso, Texas, on February 20, 2017, prior to her crossing into the US. ATTENTION EDITORS: This image is part of an ongoing AFP photo project documenting the life on the two sides of the US/Mexico border simultaneously by two photographers traveling for ten days from California to Texas on the US side and from Baja California to Tamaulipas on the Mexican side between February 13 and 22, 2017. US Border Patrol agents patrol the Rio Grande river on a fan boat on the US/Mexico border in Eagle Pass, Texas, on February 21, 2017. Attention Editors: this image is part of an ongoing AFP photo project documenting the life on the two sides of the US/Mexico border simultaneously by two photographers traveling for ten days from California to Texas on the US side and from Baja California to Tamaulipas on the Mexican side between February 13 and 22, 2017. A border fence that separates the U.S. and Mexico stands in Sunland Park, New Mexico, U.S., on Friday, Feb. 17, 2017. The Trump administration outlined a sweeping crackdown on undocumented immigrants Tuesday, pledging to hire 15,000 more border patrol and immigration agents and to begin building a wall on the Mexican border to enact executive orders signed by the president on Jan. 25. A boundary marker stands next to a border fence that separates the U.S. and Mexico in Sunland Park, New Mexico, U.S., on Friday, Feb. 17, 2017. The Trump administration outlined a sweeping crackdown on undocumented immigrants Tuesday, pledging to hire 15,000 more border patrol and immigration agents and to begin building a wall on the Mexican border to enact executive orders signed by the president on Jan. 25. A suspected immigrant is escorted by the U.S. Border Patrol to a vehicle near the U.S.-Mexico border in McAllen, Texas, U.S., on Wednesday, Dec. 21, 2016. A security surge along the U.S.-Mexico border will use 'a military-style approach' with more Border Patrol agents, barriers and sensors and new authorities for law enforcement agencies, House Homeland Security Chairman Michael McCaul said. Border Patrol agents patrol the United States-Mexico Border wall during Opening the Door Of Hope/Abriendo La Puerta De La Esparana at Friendship Park in San Ysidro, California on Saturday, November 19, 2016. DHS acting spokeswoman Gillian Christensen told the Washington Post the agency would not comment on what she referred to as "pre-decisional documents." This leaked, albeit preliminary, Trump administration plan comes after Attorney General Jeff Sessions has used his power within the Justice Department to enforce the rule of law -- recently announcing that cities and states protecting immigrant felons from federal immigration laws may lose federal DOJ grants. "This is an administration that very much is interested in setting up that mass deportation infrastructure and creating the levers of a police state," Executive Director of the National Immigration Law Center Marielena Hincapié told the Post. "In these documents, you have more proof and evidence that they're planning to carry it out." Congress has struggled to support funding figures behind Trump's increased immigration force, though, and the DHS document even identifies the price tag setbacks attached to some of their proposals. Where Trump called for 5,000 new Customs and Border Patrol agents and 10,000 new Customs Enforcement agents, the hiring of just 500 agents would cost a projected $100 million. The administration reportedly put in a formal request for $1 billion in funding for 48 miles of new wall construction, an item included in Trump's 2018 budget proposal that outlined some $2 billion taxpayer dollars to be spent on the border wall this year alone.